Before Peter Chiarelli was summarily canned this week, there were rumors abound that the Rangers and the Oilers were looking like they could be headed down the trade route at the deadline. There were rumblings that Chiarelli was going to get fired, so we held off a little on analyzing this deeper. Prior to his dismissal, Chiarelli was the subject of many jokes, but for good reason. Good GMs call bad GMs regularly and make deals with them as often as possible. Chiarelli was a bad GM. Given what we know about the (lack of) succession plan in Edmonton, there is still good reason to target the Oilers. Whether it’s Keith Gretzky, GM by committee, or something else, we know that it’s still the “good ole hockey boys” and their antiquated thought process. The Oilers are going to go for the playoffs, and you can’t blame them. They have the best player in the game and a wide open Western Conference. McDavid needs support players. The Oilers need forward depth and blue line help. Again, the Rangers have this in droves. These teams again make decent trading partners, even when not exchanging Ryans Spooner and Strome. 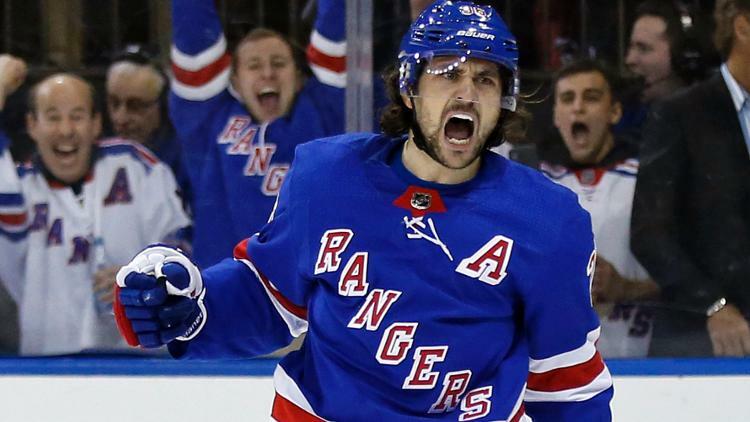 Mats Zuccarello is the name that comes up regularly with these two teams. But let’s be real, they could use Kevin Hayes, Jesper Fast, Chris Kreider, and basically anyone on this roster. The problem is the Oilers have bad contracts, thus have little flexibility to add cap space. The Rangers aren’t going to take back Kris Russell or Milan Lucic in any deal. The Blueshirts would be looking to potentially exploit the chaos in Edmonton for prospects and picks. That said, we shouldn’t expect the Oilers to give away Jesse Puljujärvi, even though his name is coming up. Zuccarello won’t (shouldn’t? Can’t say “won’t” with the Oilers) fetch him straight up. All eyes are on this new regime, whomever it be, and the first big trade will be highly scrutinized. Aside from the obvious draft picks, the Rangers would be targeting non-Puljujarvi prospects. Let’s assume there’s a sane GM at the helm, and Kailer Yamamoto (1st, 2017) and Evan Bouchard (1st, 2018) are off limits for a rental. A player under term, however, changes things. In a non-Hayes rental trade, let’s assume Ethan Bear (2015, 5th), Tyler Benson (2016, 2nd), and Ryan McLeod (2018, 2nd) are not going to happen. Cooper Marody, drafted by the Flyers in the 6th round of the 2015 draft, then traded to Edmonton, is an interesting name. He’s a very skilled winger and has a good line in the AHL this year (9-23-32 in 30 games). The 22 year old RW has great upside, but isn’t the best of skaters, nor is he good without the puck. He will take work, but he’s high ceiling. Ostap Safin (2017, 4th) is another in the high ceiling group, and appears to be a poor-man’s Chris Kreider when it comes to his speed and strength. St. John’s is terrible this year, so his numbers are skewed. He has two major tools, but would need to put it together. The rest of the Oilers’ system seems lacking, hence why they are in the bottom-third of the NHL in farm system strength. In a pure rental deal (Zuccarello) or for a lesser skilled player (Fast), I can see the Rangers getting a high non-first round pick and one of the second tier prospects. But let’s get crazy for a second, and present the scenario where the Rangers take back multi-year salary. Lucic isn’t happening (neither is Spooner, due to CBA regulations), but the Rangers could, in theory, take back Kris Russell at 50% retained ($2 million cap hit for two more seasons). If they retain 50% on Zuccarello in this hypothetical, it gives the Oilers cap space to work with this year and the next two. Is that enough to pry a Benson or a McLeod away from the Oilers? Possibly. Whereas the Rangers don’t have cap leverage with Colorado, they have it with Edmonton. Jeff Gorton has shown willingness to take on some salary to increase the return on a trade (Rick Nash trade). Here’s another opportunity to do it again. "Exploring Edmonton as a trade partner", 4 out of 5 based on 12 ratings. I think this ship has sailed, with the Oilers. The Oilers should not be making any rental deals because they’re not going anywhere. Calgary was the team last trade deadline for Zuc and I think they are again this trade deadline. The Flames have a legit shot of making noise this playoff (if their goaltending holds up). Kreider wouldn’t be a rental for them. His contract situation would give them some time to extend him after a full season for them. Speculation, and what if’s, is all this is. What does the Oilers organization have to offer that would make a trade worth while? If not Jesse Puljujärvi, or a Darnell Nurse, I wouldn’t talk to them at all unless it’s for picks, and more picks. Let’s face it, they are garbage, and will continue to be for years to come, even with McDavid. What I would do is put out an e-mail to all the GM’s and say we are open for business, and these are the people we are willing to let go for the right price!!!!!!!!!! This isn’t last year, when the system needed to be filled up with prospects. This year the target is quality. These high ceiling projects are exactly the opposite of the targeted return. It’s so far off the mark I’m surprised it was posted at all. Lets just think about this for a second – Edmonton could use any/everyone on our roster – and you think that management is trading them away for a couple of late round projects with a extremely high failure rates. there is no god dam way NY is trading any of these players to Edmonton even if it’s for ALL of these later round “high ceiling” projects that you mentioned. The Oilers need all of their prospects for their own future. If they are not going to move either of their former #1 picks, move on. How bad is Kris Russell? Undersized, not more than a 3rd pairing guy, and overpaid. His best days in the NHL are long behind him. I cant agree with you more Richter. I think the new management in EDM will be gun shy to make any major moves without a huge evaluation into what they are planning on doing moving forward. Their major moves will be in the off season. Calgary has a legit shot this year if they can shore up their goaltending. I think we can work a deal out with them for Hayes or Zucc and come back with a decent return for either. COL is just entering their window so I dont think they are pulling the trigger on giving up any of their top tier prospects that would really interest us and OTT first is off the table for sure. Pittsburgh could would be a good fit for Zucc as well and they have a track record of getting high character vets for a run in the playoffs. I would rather get a a somewhat developed prospect at this point. We have so many cookie cutter players in the organization. This year we should go for highest ceiling players we can not “steady, reliable, high character players” we have a ton of those already…. The Oilers are behind to begin with, as far as the playoffs are concerned. And to your point, 100%, new management will want to come in and assess the situation before they start trading players. Or at least that’s what they should do, lol. I also agree with your statement that the Rangers need to upgrade their talent, as they have too many of the same types of forwards. Good post, as I agree with it, lol. Like the discussion about trading with the Avs, there is no pressing need to trade Hayes or Kreider. Regarding Zucc, I think a better partner can be found. Seems like the Oilers are going to circle the wagons for the time being until the new crew can get a handle on things. I could cheer for ZUCC in an oilers uniform, if this happens. oh man would I despise seeing Lucic in NY blue, yuk! Goon whose past his prime! I miss hockey already, let’s go All Star Crap, finish it up and get back to the season already! No matter who we trade with, Gorton needs to get creative based on his perceived timeline. If he wants to be competitive next year, which includes money for FA’s then he needs to acquire strong prospects. If he thinks we are 2-3 years away, then get draft picks. Either way, the return on our players needs to go to the highest bidder. Unless we’re talking about a team’s top 3 or 4 prospects I’m probably not interested. We don’t need “maybes” and “projects”, we need bona fide prospects that are close, otherwise just grab whatever picks you can get — and yes, I believe a team will part with their 1st rounder for Zucc — albeit a late 1st rounder. I think Carolina is a much better trade partner at this time. I also agree that the Edmonton door has been closed by firing the GM. Carolina needs scoring. Has cap room. Has great prospects. Kuokkenen , Eetu Luostarinen and get back Aleksi Saarela – That’s should “Finnish” off a good trade. Saarela is a AAAA guy at best. Essentially what you are suggesting is that we trade premium players for a bag of pucks. This is how you ruin a rebuild. If the right prospect and pick is t offered, you move on to another team. There will be plenty of them looking to improve going into the playoffs. EDM’s cap situation is such a mess you’d have to do a three way deal to get a good pick and not have Russel’s cap hit kill you. Trade him to team A, team A trades him to B while retaining 50%, B buys him out in the off season. You take Kassian, Brodziak and Puljujarvi back for Hayes & Zucc, both 50% retained. If they’re even slightly entertaining the idea of trading Kreider, then JG must not offer him to any specific team or teams. The demand must come to him, then and only then, can he get the best deal. If not, then the heck with it. I think the Rangers sort of screwed themselves last Feb. by sending out the “letter”. I think the FO then felt compelled to make a deal at the deadline and took the offer from Tampa. Tampa knew they had Gorton by the balls and weaseled JT into the package. I don’t think we got royally screwed, but I’m not sure we did that great either. Sounds like another team we know! Exactly who the Rangers need from Edmonton they likely won’t give up. But if you are in the market for a 6.5 million dollar slow footed aging winger, I am sure Edmonton has a deal for you.